Pro-Banthine (Propantheline) is a medicine which is prescribed to patients suffering from conditions such as gut disorders, hyperhidrosis (perspiring excessively) and enuresis (uncontrolled urination). This drug is an antimuscarinic, and it acts in the body by blocking certain receptors in the bladder, gut and eye (muscarinic receptors). It achieves this by inhibiting the action of the chemical known as acetylcholine, thereby triggering a relaxation of the smooth muscles. Acetylcholine normally causes the contraction of the smooth muscles, which can cause uncontrolled urination, pain in the abdomen or constipation. This makes it effective at treating the conditions listed above. 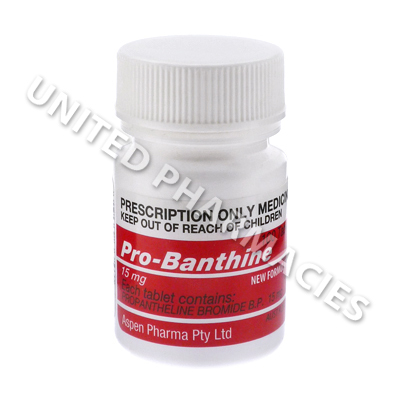 Pro-Banthine (Propantheline) comes as tablets, which are taken by mouth. Adults who are treating peptic ulcers and who have been prescribed this drug as an adjunctive therapy are sometimes told by their doctor to take an initial dose of 75 mg per day, with 15mg taken roughly 30 minutes before eating each main meal, and another 30mg taken before going to bed. However, it is also possible that patients whose symptoms are mild may be told to take 7.5mg by mouth, 3 times per day, with each dose taken 30 minutes prior to each main meal of the day. Patients who experience bothersome side effects should inform their doctor. In some cases, rare reactions which will require medical care immediately may occur. Examples include pain in the eyes, a reduction in the amount of urine passed, dryness of the skin with no perspiration, hallucinations, light sensitivity and other possible reactions which have not been listed here. Alcohol must be avoided during treatment, as it may worsen the side effects of this medicine. Patients should note that dehydration or overheating should be avoided, as this medicine can reduce sweating, which could make the patient more likely to get heat stroke. Seek immediate emergency medical attention if you suffer an allergic reaction. Symptoms to watch for, which may be indicative of a reaction, include skin rashes, hives, swelling of the face or limbs, trouble breathing, and trouble swallowing. Always use Pro-Banthine (Propantheline) as you have been prescribed by your doctor. Never self-medicate or change your dosage without first consulting your doctor. The correct dosage can vary depending on your health, medical history, and the severity of the condition being treated. If you are pregnant or breastfeeding. If you suffer from any allergies. If you suffer from any other health conditions or illnesses. If you are using any other medicine (including all non-prescription). If you are using any supplements, vitamins, or herbal products of any kind. This product is added. Thank you. * All prices are quoted in British Pound (GBP). Copyright © 2001-2019 United Pharmacies (UK). All rights reserved.